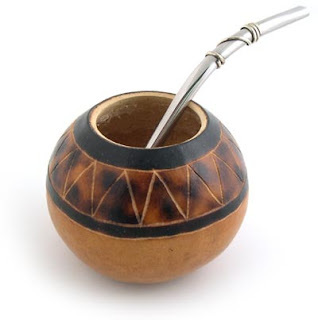 Though I don't have my own gourd, I bought some mate teabags at the store. It's so dang cold, and I love my hot beverages. And Paulie says it's good for you. And I swear its an appetite suppressant. It's really wild. I'm super squishy (not exercising), but thinner. Go figure. Go Mate! mate, que delicia!!! I drink it every morning. I never had it with sugar until recently and now I can't turn back. Needless to say I am probably gaining weight because of it. Mate in Japan?! I've only seen it in South America. That is so random.